We introduce the idea of relative iterations of three functions and using this, extend a theorem on fix point of complex functions involving exact factor order. Relative fix points, exact factor order, complex functions. Bieberbach L., Theorie der Gewohnlichen Dierentialgleichungen, Berlin, 1953. Baker I.N., The existence of x points of entire functions, Math. Zeit., 73 (1960), 280-284. Hayman W.K., Meromorphic functions, The Oxford University Press, 1964. Bhattacharyya P., An extention of a theorem of Baker, Publicationes Mathematicae Debrecen, 27 (1980), 273-277. Lahiri B.K., Banerjee D., On the existence of relative x points, _Istanbul Univ. Fen Fak. Mat. Dergisi, 55-56 (1996-1997), 283-292. Banerjee D., Mandal B., On the existence of relative x points of a certain class of complex functions, _Istanbul Univ. Sci. Fac. J. Math. Phys. Astr., Vol.5 (2014), 9-16. ISNAD Banerjee, Dibyendu , Mandal, Biswajit . "Relative Fix Points of a Certain Class of Complex Functions". 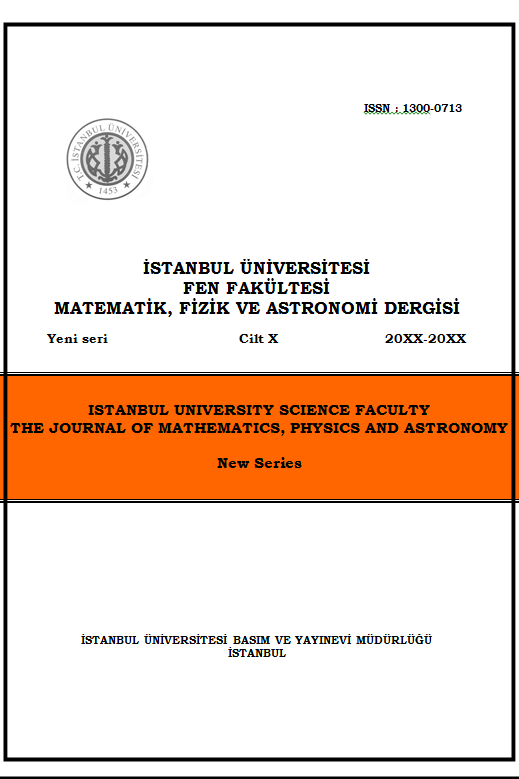 İstanbul University Science Faculty the Journal of Mathematics Physics and Astronomy 6 / 0 (June 2015): 15-25.